Just about everyone knows that we have a heart for adoption. We knew before we were even thinking about moving to Uganda that we were going to be an adopting family. Almost one year into our time here we started the process of fostering Silas with the intention of adoption after three years (Ugandan laws). We have now had Silas for just over two years and for about the last year we have been prayerfully considering foster-to-adopt a second child. We visited an orphanage in another part of Uganda where you adopt two little ones at once. We prayed and prayed for God to show us what was next for our family. Nothing clear was coming to us. So we just waited. We felt like God was telling us to go back to the baby home that Silas came from, and so we went and told them to also be praying along with us about our second child. Colin and I were praying about a little boy who was just about 1 year old. For some reason it just never felt like we were to bring him home and I just couldn't understand. He needed a family, and we wanted to give him that. When we got to Amecet, we were walking in and the social worker caught us getting out of the car. He looked at Silas and said "Oh! Silas are you coming to see your little sister?" All I heard at that point was "little sister". I couldn't get my shoes off fast enough to get in the doors! Little baby Aggie (or Hellen as they called her at Amecet) was brought in the day before and was only 10 days old. Both Silas and Aggie share the same mother who is unable to care for herself and for her children, sadly. We knew right then and there that this is the child God had been preparing us for. And how wonderful that Silas and Aggie are biological siblings! God really knows how to take a sad situation and still make it into a beautiful story of love. We would have wrapped that little bundle of pink up and drove straight home with her that day, but we needed to wait for the police and probation to do their jobs so we had the correct legal documents for little Aggie. That took an extra two months (almost). We would go on a regular basis to visit and Silas loved getting to hold her and play on the slide, however all my heart wanted was to get her HOME. I don't know how families in the US who adopt overseas do it. I can't even imagine waiting a year, or two. But thank the good Lord we only had to wait for a little while. We had some stressful dealings with probation but on October 17th, 2014 the day little baby Aggie Hayes was able to come home with her family! We have chosen to name her Aggie Hayes as an "Aggie" is just about the best thing a person could aspire to be, and "Hayes" is a family name on Ronnie's side of the family. That morning when we first got to meet Aggie, Colin had a dream the night before, or a direct word about our next child. He told me when we were driving home that first day that he knew when we left to go visit Amecet that we were going because they had a baby for us. He said that he either dreamed it or that God had told him, but either way he knew. I still can't believe that we are now a family of 4. We have a handsome, almost 2 1/2 year old little dude that we LOVE more than words, and now God has given us this beautiful little sister who already has changed our home for the better. 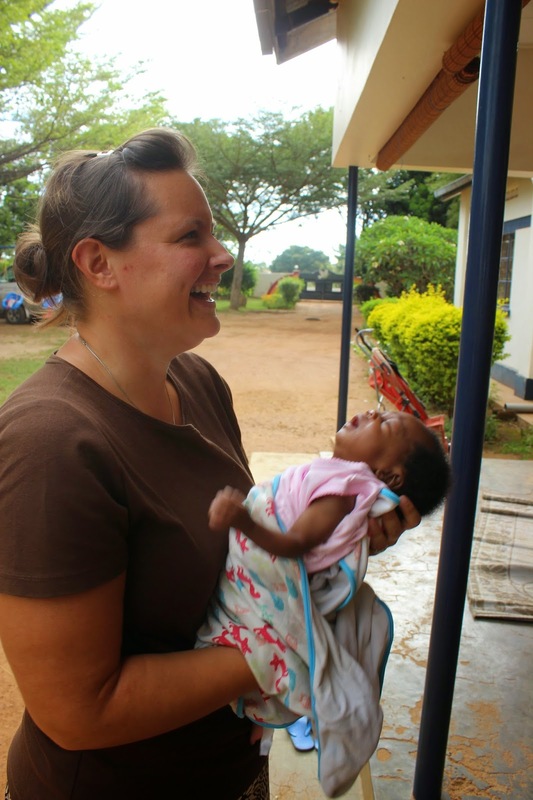 I sometimes find myself shaking my head because when we first visited the other orphanage I had sat down and proclaimed that I didn't think that I could handle having a "BABY" just yet. Well, Ronnie, God says you can and you will so here you go! One of our first meetings with Aggie. She was about 12 days old. Our wonderful friends Rachel and Daniel (who are also adopting a little one from Amecet) were with us the day that Aggie was handed over to us. Els (the woman who started and runs Amecet) handing over little Aggie to us. The first family photo...of many!